Just imagine: gaming machines are more than 115 years old! The first gambling machine emerged in 1891 in New York and was designed by Pitt and Sittman. It contained 5 drums with poker hand images. Note: The gambling device invented by Pitt and Sittman had no payback mechanism and thus places that were equipped with it had to pay back using their own resources, usually free beverages. Charles Fey is fairly considered to be slot machines inventor as he made the first slot machine and called it a “Liberty Bell”. This event took place in San Francisco in 1899. The slot machine created by Fey consisted of 3 spinning reels which contained images of 5 symbols: a Liberty Bell, horseshoes, diamonds, hearts, and spades. Unlike modern slots that we know today, slot evolution Fey’s machine was quite simple and that pushed its inventor to design a primitive automatic payout mechanism. Thus in a situation when a gambler was lucky to hit three bells in a horizontal row, s/he would enjoy the jackpot that amounted to 10 nickels. After the Liberty Bell machine slot evolution has seen a lot of different copies and imitations. But all of them based on the original Charles Fey’s slot machine model. Among them one can mention Mills Liberty Bell, Operator Bell and other slot machines. Classic cherry and melon slots became popular among gamers due to the juicy images on the reels and various flavored chewing gums prizes. Another traditional symbol on the slot reels is the “BAR” which was the Bell Fruit Gum company logo. In 1915 cast iron gambling machines were replaced with innovative wooden cabinets. Those cabinets were much easier to construct, transport and equip. The earliest electro-mechanical gaming machine was developed in 1964 by Bally Manufacturing and was named Money Honey. It was the first slot machine that began to differ from the original “liberty Bell” model. The advance of the science allowed thrilling flashing lights and background slot sounds. The Bally Manufacturing entered the slots market and remained a leader for a very long time. In the middle of 1970s it introduced a new Dollar slot machine which was a popular slot type in many casinos. 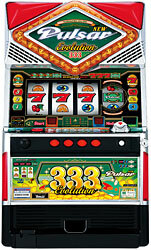 Slot evolution resulted in modern slot machines conquer the gambling market with a great speed. They differ with enormous variety of colorful symbols on the reels, fully automated mechanism, current detector that verifies the coins that are being inserted and, of course, the random number generator which is the key component that generates the random numbers excluding any fraud and trickery.